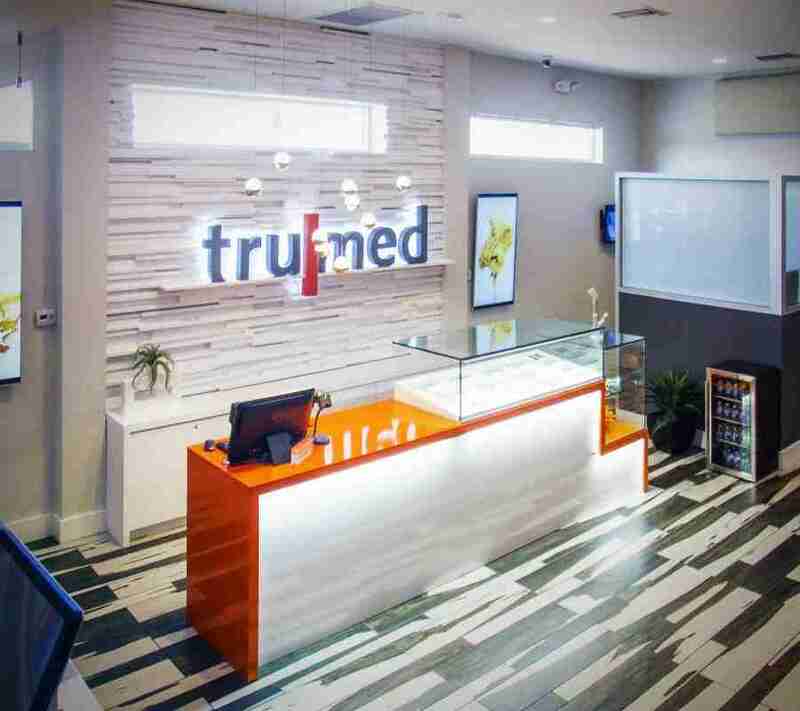 Tru|med dispensary is an upscale cannabis boutique that servers the greater Phoenix area. Inspired by design trends of boutique bakeries and cupcake shops, the concentrate bar features LED-lit glass displays at counter-level. Silestone countertops in the perfect shade of Tru|Med orange were custom fabricated with waterfall detailing. 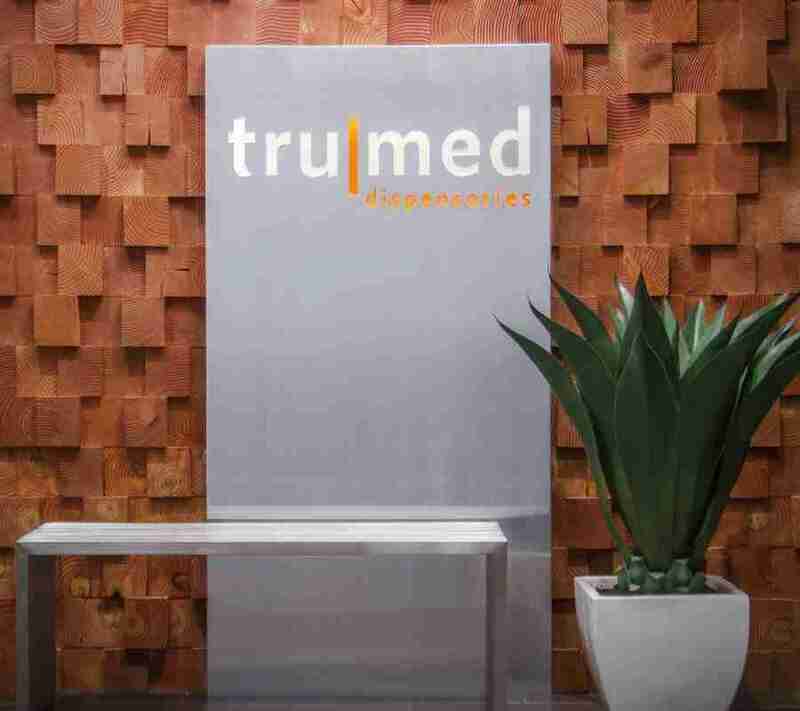 The feature wall behind the counter plays off of the custom wood feature wall in Tru|Med’s lobby and includes over 1,000 pieces of wood staggered at varying depths. Finished in a gloss white, the wall creates movement, texture, and a contrasting background for the 16” tall custom metal back-lit logo that rests in front of it. A WAC Genesis light fixture– that pays homage to the trichomes that concentrate products are derived from– hangs over the bar, providing the finishing touch to this bespoke retail area. Our patient education area invites our clients in so they can learn about our variations of medical cannabis in a safe and comfortable environment. It is important to us that all our medical cannabis patients leave feeling empowered and knowledgeable. No one likes sitting in an overcrowded, stuffy waiting area. 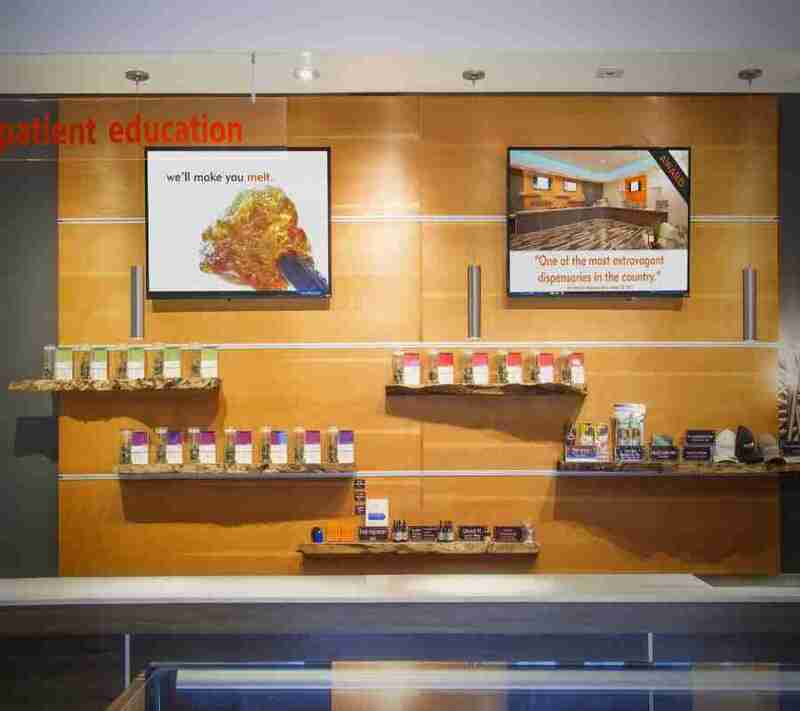 At tru|med dispensary, it is important to us that you have a wonderful experience from beginning to end. That is why we decorated with soothing tones and a luxurious staggered wood wall. At tru|med dispensary, we take your safety seriously and that is why we have security on site everyday. Come enjoy your visit with peace of mind.